SOUTH KOREA: Doosan Heavy Industries has acquired an operating prototype, designs, and rights to sell the 5.5MW offshore wind turbine designed by electric control systems specialist AMSC and Hyundai Electric and Energy Systems. Doosan will supply the turbine to the first 60MW phase of state-owned Korean Offshore Wind Power’s 2.5GW Southwestern project. The 5.5MW turbine will be available in Taiwan and Japan, as well as in South Korea, AMSC said. Daniel McGahn, president and CEO of AMSC, said: "This agreement helps us grow our market presence in both the South Korean and growing global offshore wind market." 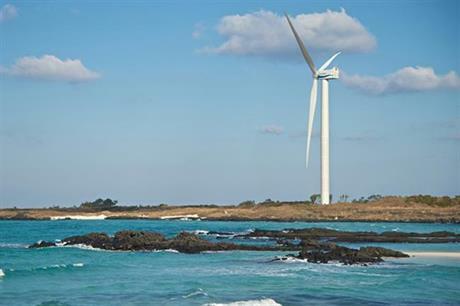 The turbine has been operating for nearly three years in South Korea’s Jeju Island, reportedly withstood wind speeds of 55.43m/s (199.56 km/h) during typhoon Chaba in 2016. The acquisition increases Doosan’s portfolio, adding to a 3MW model it already offered. US technology firm AMSC has become the exclusive supplier of electrical control systems for the turbine. It will be fitted with AMSC’s control system, using its PowerModule converter, which matches the variable speeds of the wind turbine with the fixed frequency of the grid, the US firm said. The systems also feature pitch and yaw converters, and supervisory control and data system (SCADA), which collects and stores both real-time and historic data on turbine performance.